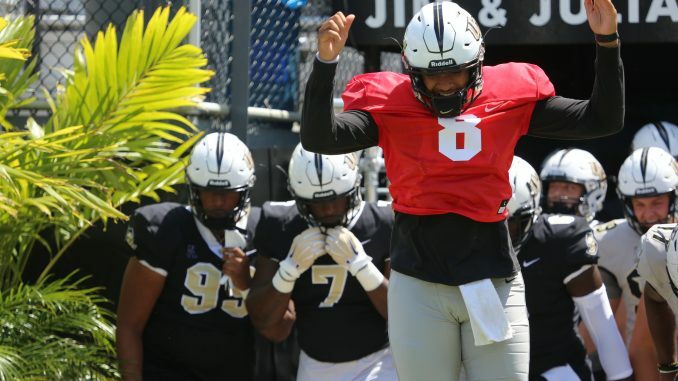 UCF’s spring game on Saturday offered fans their first chance to get a glimpse of the four quarterbacks vying to replace injured star McKenzie Milton in 2019. It took about 20 seconds for one of them to stand out. Darriel Mack, who took over for Milton last year and led the Knights to a conference championship, got the first drive for UCF and immediately made an impact. On his first play, he chucked the ball to Gabe Davis for a completion downfield and sprinted to line up to throw again. And before fans had even settled into their seats, Mack had found another receiver in the endzone for the first touchdown of the day, on his second throw of the game. Even though he outshined the other quarterbacks, Mack claims he isn’t worrying about the competition. Mack may have come away looking like a starting quarterback, but the team knows that the battle is far from over. Coach Josh Heupel still has more than four months before he has to name a starter, and Mack is facing plenty of tough competition. Notre Dame transfer Brandon Wimbush is unquestionably here because he wants the starting job, true freshman Dillon Gabriel has impressed coaches early despite his lack of experience and backup Quadry Jones turned in a surprisingly effective spring game performance. Heupel says that none of the four players have stood out to him enough yet to be named the starter for 2019. Perhaps the biggest disappointment of the day was Wimbush. He arguably became the highest profile transfer ever for the Knights in January, when the former Notre Dame starter picked UCF to use his final year of eligibility. He was largely unimpressive throughout the game, often throwing off-target passes. He also struggled to get the ball off at all, and ended up getting sacked six times. While some of those were indisputable, a case could be made that some plays were called dead too early, with the team using a one-hand touch policy for quarterbacks. Wimbush did have a nice play later in the game, when he perfectly lobbed the ball to the back corner of the endzone for a touchdown pass to Jacob Harris. He hopes to keep building on what he has learned from playing with his new team so he can keep improving as fall approaches.